The French Open tennis tournament (tournoi de Roland-Garros) started this weekend in Paris. Whether or not you are a fan of tennis, we thought you may enjoy views of the Eiffel Tower overlooking the vibrant red clay tennis courts of the Roland-Garros stadium. The video below shows the French Open getting ready for 2011 — it starts with the Eiffel Tower, covers the grounds (including lovely plants & flowers), the fans, the athletes, and of course those gorgeous tennis courts — love the color! The Roland-Garros stadium opened in 1928 (although the annual championship for French men’s singles dates back to 1891). Roland-Garros is named after the French aviator Roland Garros (1882-1918). Mr. Roland Garros was the first French aviator to cross the Mediterranean sea on September 23, 1913. He started on the French riviera in Saint-Raphaël and flew to Bizerte in Tunisia. Roland Garros’ journey took almost 8 hours and was 730 km (about 454 miles). He died in combat during World War I. The French Open takes place on a 21 acres property on the Rive Droite (Right Bank of the Seine) in the 16th arrondissement of Paris (16ème arrondissement or simply le 16ème) — one of the most upscale of the arrondissements in Paris. But the Roland-Garros stadium is not all about tennis — outside the two week period of the French Open, you can dine at “Le Roland Garros” — a restaurant in a Normandy style cottage right at the heart of this prestigious tennis venue. 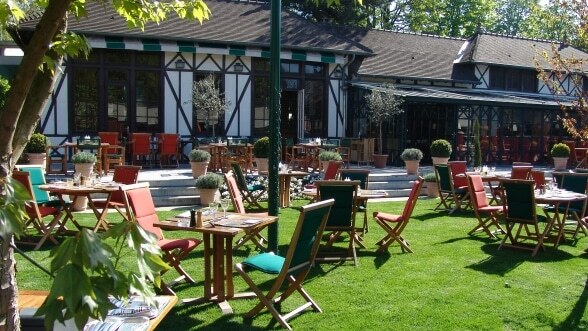 “Le Roland-Garros” also offers a beautiful terrace in a peaceful and sunny garden setting — perfect for a summer lunch! The Roland-Garros stadium is also adjacent to the beautiful greenhouses in the Jardin d’Auteuil (Serres d”Auteuil) — sadly likely to be reduced in size due to the controversial Roland-Garros expansion project, but we shall see. And how can you talk about the French Open without talking about Chris Everloyd, the American tennis player who won the French Open 7 times! Here is a short clip about one of the female star of the French Open, enjoy!